Devdas is a 2002 Hindi film based on the Sharat Chandra Chattopadhyay novella Devdas. 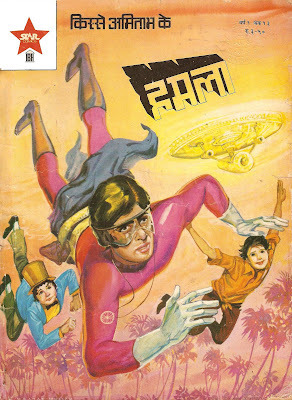 This is the third Bollywood (Hindi) version and the first colour film version of the story in Hindi. The film is directed by Sanjay Leela Bhansali and stars Shahrukh Khan, Madhuri Dixit, and Aishwarya Rai in the leading roles. At the time of its release, Devdas was the most expensive Bollywood film ever produced, with a reported budget of Rs 50 crores. Here we are presenting the DETAILED Boxoffice Description of its Performance. Check Details of Weekly box-office figures at the end of this article. Apart from India, it collects excellent overseas figures of 28 Crore. Total Worldwide Revenue: 33.5(India) + 28(Overseas) = 61.5 Crore . Worldwide distribution share comes to 36 Crore. Devdas was reportedly budgeted at Rs. 42 Crore and 50 Crore including print and publicity cost. Revenues from Worldwide theatrical share comes to Rs. 36 Crore. Revenues from all other sources sums up to Rs. 15 Crore. This yields 51 Crore Return. Movie was produced by Bharat Shah. Devdas was most expensive movie of its time. 50 Crore budget of any movie even in 2010 is considered as huge. On surface level movie incurred Minimal losses. Relative performance Very Good Compared to biggest Hit of year Raaz, Kante and Aankhen. Recall value Very Good, Always remember as decent remake of classic Devdas. BollyBusiness Note Despite of Good trending in India and abroad, high price tag of movie incurred to minimal losses. Still WOM, Trending, Relative Performance and recall Value are factors which despite of losses enable this movie to come in above average category. ~ by Yakuza on March 10, 2010. Thanks BOSS for this excellent piece. I know movie did well , But price was such a huge which can only be recovered if movie would have been mosnter hit like Gadar. This movie was total loss. Thanks again. How can nett be 64.5 cr and Share be only 26 cr!! And back then it used to be single screens more, so share would have been higher. @ Doga I agree it should be around 65% of nett for domestic and around 55% for oversees..still if the budget is 50 cr its a money looser..
Hey Doga, How are you Bro? Yup, It was typo, DS is 36 Crore Indeed (Not 26). Corrected. So you lied? Typical. Trying to bring down SRK as usual. Truth will alays out. Devdas is a superhit. Bollybusiness is a flop show these days. Stop creeping to Aamir and get your facts right. MNIK is a HIT. go read boxofficeindia if you want some honest figures. I haven’t words how I will appreciate ur work Yakuza,ur work is Awesome,If u remember I said several times about this film and u fullfil my request,thanks alot,Many peoples are considering that Devdas is Superhit film but u bring real facts and fact is that Devdas is Above Average film. Hope Sir u will continue ur work like this and we r with u.
Bollybusiness.wordpress is the real site of bollywood. Excellent work indeed. Thanks Yakuza. Nett Numbers are quite detailed though. so why are you visiting and then posting comments. lol. Lolzz, BOI who have given stupid unbelievable low numbers for Atithi out of thin air ?? BOI is such a crappy site not even maintaining any archive ..
Can yoy show me any page from BOI who has such details of devdas or any movie ?? BOI straight forwards put figures without any authentication .. sucj a loser site .. Bollybusiness is best ever i have seen. So now go and piss on BOI. It’s better than bollybusiness who cant even deliver figures for weeks on end because they cant hack into someone’s server. So dotn start dissing BOI who at least are consistent. Bollybusiness is a lying anti SRK set up. Probably run by ShivSena. I agree. Devdas was a Supetr Hit (go and look on ibosnetwork and boxofficeindia if you want proof!) Bollybusiness is anti-SRK. Devdas made a huge profit and you say it made a loss? You are backtracking on your own figures!! And MNIK is a HIT according to every other website except yours. But your lies wont work because people like me and arjun will fight your lies and misinformation! Now tell me whi lies ?? And MNIK is Average by Vinod , TOI, NDTV and BollyBusines . (4) .. Hit By Only BOI and Taran (2) .. So who is in majority ?? @Jeevan u can also add him with ibosnetwork who called it FLOP direct. Nads, even if we believe BOI figures .. no one who knows anything about box office goes by BOI verdicts .. pro or anti srk doesn’t matter. Talk to anyone who knows about this, they will tell u what crap BOI verdicts are. @Yakuza: Why u called this film above average as d film distributers loses some amount, anyway can u tell me why u called it Avobe average? pls. A movie that just breaks even is Below Average in terms of ROI. Due to other factors like Nett Collections and WOM, etc it can get higher rankings. Veer and MNIK among recent films underperformed in terms of ROI. But both are categorized in the average section because Net Collections were high, WOM was mixed and the reason for their flop is only high cost. I think you wouldn’t want Veer to be called flop. Lets have the same standards applied to all movies. n were ndtv said it is avg. Don’t know abt the BO figures….but it definately was a gr8 film gr8 performances from every1. But the best work came from Bhansali the director who made a haunting movie and SRK & Aish delivered one of their best performances ever. yakuza.. sorry to say…but your knowledge of Indian BO is very limited… since when did the budget of a movie become the means by which ROI and bo verdict is calculated…Isnt it done with with distributers’ cost? Plus, do you actually beleive that Devdas’ budget was 50cr? lol. street, if i am taking ROI against Budget, I am quite lenient on that, because worldwide Distribution price of devdas can never be less than budget. If i am considering budget, it goes for benefit for movie. Please note i am considering ROI including revenues from all other resources, Here i am too much lenient taking budget against revenues, otherwise losses will be huge taking distribution price as investment. You should take it on positive note. u r right..the worldwide Distribution price of devdas should be more than 50 cr (as the budget was 50 cr) the producer surely cannot sale it by making a loss. Then add 5-10 cr for print and publicity worldwide. In that case ROI is always less than the investment…so Devdas should be flop/below average..not avove average..if u believe the 50 cr budget..
btw.. Devdas’s distributers’ cost was less than 30 cr if I remember well. ANd that 50 cr budget was simply a publicity stint. Tell me this.. before Devdas, there had only been ONE movie that had netted more than 50 cr in collections. So, was Bharat Shah an idiot to spend that much on a movie? What was he expecting? on the best case scenario, he’d have a 10 cr profit. That’s just stupid business. Secondly, when there are people willing to make a 30-40 cr movie with SrK, it’s because of the ability to recover their money through non-theatrical revenues complementing the cinema collections.. something none of the stars can guarantee. In fact, in recent years.. some of the directors that have made movies with him (KANK, MNIK) have actually targetted the overseas audience primarily.. and put the Indian continental segment in the back-burner. How many movies had done 100 cr business (in nett amount) before FOX bought MNIK for 98 crores. Just one, still it was bought by FOX for that amount. What were the expecting? hahaha … only one movie of 50 cr+ nett? Heard of DDLJ, HAHK, Gadar. And of course, some question whether Raja Hindustani and KKHH, but as per BOI, they are 50 cr nett movies as well. Shows how big a moron you are. Yakuza, you rock !! We believe your numbers and knowledge is much better than morons like street!! and who says MINK is a 98cr film? Have you seen the movie? Where did they spend the 98 cr? plus jeevcy… so ok not one .. but 3…how much of a difference does it make? Anyways.. anyone with an iota of understanding of the Indian box office system knows that it’s not the budget that decides that verdict of a film.. it’s the distributers cost. IT’s been like that for the past 100 years… unless the official trade journols “film INformation” and “Trade Guide” have changed their ways in recent times.. for specific films. Also.. if you wanna go by budget, then might as well count all teh non-theatrical revenue too: music sales, satellite rights sales, re-runs, and in movies like Devdas costume sales, jewellery sales etc etc . Even when it comes to overseas, the numbers presented above only mention the major circuits US and UK. What about Canada, Africa, Middle East and other parts of Europe. Anyone who’s lived in S. Africa, Kenya, Dubai, Toronto, Hamburg, Frankfurt or for that matter far east countries like Malasia, Indonesia etc will attest to you of how sizeable a fan base SrK has there. These individual centres may not bring in a million each.. but the aggregate is pretty sizeable… it all adds up. Even though BOI or anyother BO site may give us a “rest of the World” gross, they represent a fraction of the total gross.. since most films dont release simultaneously at these centres. And more often than not, they have reruns, since they’d rather have a SrK film playing a Sudanese cinema for 6 months, than no-name (read: Hrithik, Akshay, Aamir) movie for 2 weeks. As I said, when there are producers willing to spend 30-40 cr on a movie with SrK, it’s because of the fact they can recover their money from these other sources. It’s reasons as such that Indian trade analysts never use budget as a barometer to guauge a film’s success. It’s individual distributer cost for a circuit vs the collections (minus taxes) for that circuit. So in this case, Yakuza claims that the distribution cost was 36 cr (from what I remember it was definitely under 30 cr, specially for India) .. but let’s assume the 36 cr number to be right. Then we have a 61 cr nett recovery (that’s minus all taxes, and other cost). That’s a clean 25 cr distributers’ share (read clean profit) .. how is that not a clean hit? Incidently, BOI has a distributers’ share of 23.5 cr. from Indian territories alone. so yes.. you have all these numbers splashed on us mr. Yakuza.. but it’d be nice if you could actually understand them and put them into perspective before coming to conclusions. Can you just decide whether you are going to go with producer’s cost (budget) or distributor’s costs? And you are a joke. MNIK budget was 38 Cr but it was brought for 100 cr..it earned a total aproxx 200 cr and they still call it flop..Sick..
You are relling me that it cost Bharat Shah 50 cr to make this film. And he sold it for 36 to distibuters. Why would he do that? so why did Bharat Shah make this 50 cr film … if he was never going to get that amount back.. even if the film were going to become an HAHK or Gadar? since the distribution rights are bought and sold well before the film releases, and whatever the film does at the BO, it’s for the distributers/exhibitors to keep. It doesn’t make any sense for Mr. Shah. btw.. Shah himself distributed the film in the Mumbai territorry, but that’s an entirely different issue. It doesn’t make any difference. First of all, Devdas never cost 50 cr to make. To begin iwth it only has one male star SrK. female stars don’t have that significant a billing. Then, there weren’t really any overseas shootings where they would have to fly a whole crew to US, Canada, Australia or Switzerland. PLus, there was barely any shooting in real locations to begin with. It was all done in the studios. So none of the crowd control costs associated with shooting on real locations. ALso, the film was a love story, and devoid of any action or special affects. So none of the costs associated with blowing up cars, trucks and planes, unless you consider the cost of those fake liquor bottles being smashed on the floors a major amount. The only real major cost in Devdas accounted from those sets that Bhansali wanted to be built and the costume, jewellery that the cast wore. But even there, those costumes were rented or else, whatever that was bought or ordered to be prepared, were at the end of the film auctioned back out. If anything Bharat Shah made a clean profit from them. The rest of costs associated with this film, are no different than any other films’ costs. There’s every reason why a film like Lagaan or ShahRukh’s own Asoka and MHN should cost more than a Devdas. These films required the whole crew (men and equipment) to be flown to real locations and all the security, fan control costs associated with it. It’s hard to convince anyone that this fim cost more than 25cr to make.And that’s an amount Bharat Shah recovered very easily, from distribution rights sales, music rights sales, sattelite rights sales etc. Street, to be straight as specified in article, cost was 42 crore and with prints and publicity, it went on to 50 Crores. To put in the simplest manner.. you cannot calculate an individual’s profit by accounting for another individual’s cost. Theatrical colllections are revenues for distributers/exhibiters. Movie budget is cost to movie producer/financers. the 50 cr number doesn’t pertain to these individuals. These guys never paid that amount to the producers. They paid 36 cr (as per you since I think it was less than 30cr). so we have 61 cr (25 cr return) vs 36 cr investment. P.S. Bharat Shah, if I remember well, actually did the distribution in Mumbai himself. a very smart move, coz the film did its best business in that circuit. Things are pretty straight and simple in above analysis. I don’t guess you need any further self assumptions on this. BTW why distributors will give their earned money of 36 Crore to producer ?? Don’t panic, Devdas was good grosser, relax. There’s no self assumptions here. You are simply fudging two different sets of numbers that pertain two different groups of people. You are comparing nett collections of a movie at the ticket counter vs the budget of that film. These two figures have nothing to do with teh same person. ONe of them (collections) ngoes to teh distributer, and the other (budget) has to do with the producer. I don’t know how can I get any clearer on this. You have messed them around.. by taking the highest of the costs and subtracting it from the lowest of the revenue, just to come to the lowest possible profit margin. Typical of somebody trying to skew numbers to get to a certain desired conclusion. Or maybe, it’s simply a matter of unintentional error on your side. And that’s not even talking about the improbability of the budget being 40,50 or 60 cr. Why don’t you just fix it? It shouldn’t take you that long. street, its you only who is fudging g up things, Who is comparing Nett collections with DP ??? Yakuza has clearly comparing DS of 36 Crore coupled with other revenues to make it breakeven against total cost of movie i.e. 42+8 = 50 crore. What the fuckk you are talking about ?? Don’t confuse others by these silly and ambiguous comments. 1. Distrributer profit = (nett collections) – (distribution cost+exhibitor cost). I have observed this over-enthusiasm and anxiety for SRK movies on almost all bachchan fan sites. The agenda works on different levels… often to reduce the totals… and if that doesnt work then to come up with their own logic to why films are flop despite huge business. The good thing about this site- unlike ibos and others- is it does not go the racist or bigot way. It stays within the ambit of films and business in presenting an argument, however skewed it may be. I would be very interested in knowing how Ghajini is a blockbuster. As far as I know it was also sold for 90-100cr, and it did 110cr net in India and 25cr net overseas. The total distributors share would be around 60cr in India at max. How is it a blockbuster? Ghajini had 78 crore distribution share against 63 Crore theaterical distribution price (Studio 18). This yields to 15 Crore Nett profit for distributors only. The producers, on the other hand made Rs. 53 crores (Domestic) + Rs. 8.5 crores (music) + Rs. 10 crores (international BO) and have yet to sell satellite and home video rights, which should fetch them another Rs. 25 crores or so for a total of about Rs. 96 crores. This is a HUGE hit as the cost of production would be in the Rs. 40 crore range and prints & advertising would be another Rs. 12 – 15 crores. Movie is blockbuster or not is subjective thing, But it was good profit maker(15 Crore) for distributors and excellent profit maker for producers. ok thanks. but am not sure if the price is was so less. lol.. Devdas in 2002 cost 50cr to make.. while Ghajini in 2008 cost only 40 cr? btw, heard of Sunny’s The Hero? Do some google-ing and you’ll find hundreds of articles claiming it to be the most expensive movie ever at 55 cr (before its release).. but then only a year later Anil Sharma himself admitted that it only cost 25 cr to make that movie. The hero was always be 25 crore budget movie, I never heard or see any quote claiming 55 crore movie. Even at that time i was not having much boxoffice knowledge always thought why Hero is declared flop despite doing 26-27 crore business, 2 crore more than budget, Later on i came to know about this DS theory and realised why Hero was failed. So don’t make fool others by saying false things. Hero was tauted to be 25 crore movie from first day itself. and here you go. Don 2 gets 105cr! I dont believe the story that the distributors lost money with MNIK. If that’s the case why would BIG buy Don 2 for 105cr? Mumbai: Bollywood pashas are on the move again. After a lull of almost a year, when the economic slowdown robbed showbiz of its glitter, there has been some serious trading happening in Bollywood in the last three weeks. Trade reports say that Eros International has closed the deal on an Imtiaz Ali-Ranbir Kapoor project at Rs 55 crore; UTV Motion Pictures will get the worldwide rights of the Farah Khan-Akshay Kumar flick Tees Maar Khan at Rs 55 crore reportedly; and Reliance Big Entertainment is said to have acquired the Farhan Akhtar-Shah Rukh Khan project Don 2 at an alleged Rs 105 crore. A trade source confirms that Big is also keen on adding the Shah Rukh Khan-Anubhav Sinha project RA 1 to their roster and the prices being circulated for the acquisition are reportedly even above the price of Don 2. Besides these, leading film corporations are bidding for the rights of one more project with a star son. A trade insider says Eros (one of the film corporations that is reportedly coming up with their IPO) is part-producing Rockstar with Ashtavinayak Cine Vision. According to Pachisia, My Name Is Khan has added to the coffers. Aamir’s 3 Idiots is instrumental in getting the actor’s stock to rise to an all time high. SRK’s announcements—Don 2 (September 2010) and RA 1 (March 2010)—are being keenly contested for. Other actors whose projects are being studied are Hrithik Roshan, Ranbir Kapoor, Akshay Kumar and Abhishek Bachchan. “Reliance Big Entertainment, who have come into the market scouting for big projects, are likely to get both films. Don 2 is already committed to them,’’ say sources. “There is no official announcement on RA 1,’’ says an insider. thanks anuj for that article. Again, though there’s no official word on those numbers, one can make a number of observations. Tees Maar Khan goes for 55 cr, while Don 2 goes for 105 cr. Notice, how Tees Maar Khan is in so many ways a massier film copared to Don2. First of all, it is comedy vs thriller. The former is anyday a safer theme and pulls larger crowd than the latter, simply coz while thriller attracte mostly adult males, comedy caters to males, female, kids and adults. Secondly, while SrK in Don is not playing to his strength, Akshay is synoymous with comedy. This is his strength at the BO. 95% of Akshay’s hits are comedies. Thirldly, cmmercially Farah Khan is a bigger director name than Frahan Akhtar. While Farah has a success rate of 100% with a superhit and blockbuster in her kitty, Farhan has had a hit, a semi-hit and a flop. The only thing going in favour of Don2, is that it’s a sequel. But then Don1 was no blockbuster either. Inspite of all this, SrK’s Don is being bought at twice the price of Akshay’s TMK. This clearly shows SrK’s market value compared to his competition. agree…that is crazy. i think its stupidity by Reliance. I will be shocked if this recovers its money. expect another ‘fox/MNIK’ type of cover-up. i think its madness that Don2 has been bought for 105crs. the producers/studios have gone crazy – when will they learn? btw.. still waiting for Yakuza to fix the original post in this thread. First you need to fix your mind. News to me Devdas was above average good joke. Almost every Trade had rated Devdas Hit except Komal Nahta who had Semi-Hit which means Hit automatically as his Classification is the most strict.This Joker Yakuza has created new status for Devdas.Stop fooling people Devdas was Hit and whole world and Trade knows that who is this idiot Yakuza calling it Above Average. In the past BOI Verdicts were wrong and Biased till 2003 which they changed when they checked other trades have those Movies as Hits and they have low Verdicts for them. It is not about becoming fan they made themseleves right which they were wrong. Haa .. You moron, Till 2003 they were taking numbers from Komal Nahta’s Filminformation magazine, But when ownership changed in 2004, BOI become pro SRK and start manipulating numbers. You can check all amitabh movies numbers and verdicts has been systamatically decreased and all SRK movies and verdicts has been increased. This is clear case of biasedness which creeped in after 2003. Shruti, you are right. They also changed BO verdict of Aamir, Akshay Kumar and Sridevi movies..
Yakuza Komal Nahta have Devdas as Semi-Hit, Mohabbatein Super Hit (In Year End Classification He had it Hit, but 2001 Half Yearly Mohabbatein was changed from Hit to Super Hit by Komal Nahta) and Josh as Above Average. How come you have lower rating than Komal Nahta? For BOI on Amitabh Movies you are arguing that BOI ratings are lower than Film Information. For SRK Movies your ratings are Lower than Komal Nahta (Film Information). Explain this. And one more thing for Salman HTHS is Above Average and for SRK HTHS is Below Average why 2 different Verdicts for same Movie? what was taran’s verdict on devdas yakuza?